Every time that I read this verse, my mind pauses in awe of the picture that is framed for us. Here, we have a record of an event that was most probably a daily occurrence. God, the awesome Creator, was found walking and having fellowship with his creation. God was calling for Adam and Eve as he walked in that beautiful garden that he had made for them. They hid themselves from their holy Creator because they were afraid. This is the tragedy that results from sin. Everyone knows the story, how Adam and Eve were both cast from the garden of Eden. No one knows the anguish that Adam must have felt throughout his long life of not having that closeness he once enjoyed with God. Oh, but this was not the case in the very beginning. On that third day of the creation week, God caused to grow from the ground all vegetative life. He spoke them into existence. What an awesome God. In Genesis 2:5, we find the phrase “before it was in the earth”. This means that God created all plants without the benefit of seeds. But, in Genesis 1 verses 11 and 12, our Creator caused these plants that he made without seeds to bear seeds within them. Grasses, flowers, trees, vegetables, and all other forms of plants were caused to grow, mature, and produce seeds in a single day. Nothing is too difficult for our God. From chapter 2 of Genesis, it appears that God lovingly and with tender care took some seeds from the plants that he had created on the third day, and planted a garden. He did this very possibly on the sixth creation day; the same day in which he created mankind. Again, by the creative power of his Word, he caused this garden to grow, mature, and produce fruit in just one day. All this he did because he loved and cared for this special creation whom he called man. My wife, Laura, asked me, “Why didn’t God just speak them into existence, instead of actually planting seeds into the ground?” I suppose, that by this act, God demonstrated his affection for man. Also, he might have used it to teach Adam the principle of seed time and harvest. Either way, our Creator did it all for the benefit of that creation in which he made after his own image. It appears from verse 8 that God enjoyed those quiet evenings there in the garden in the cool of the day. No doubt, in those intimate conversations, God must have shared with Adam and Eve the actual sequences and creative words that he used in that first week that even included man’s own existence. He probably shared with them the wonders of some of his creation. Secrets that would later be lost by mankind. Some may have been rediscovered centuries and millennia later, and others, yet to be found. He may even have shared with them the ultimate outcome and future destiny of mankind. By inspiration, the author of Genesis is emphasizing the fact of Enoch walking with God. Enoch lived in the seventh generation from Adam. He was a direct descendant of Seth. The Bible puts its searchlight on another individual who also lived in this seventh generation. I believe it does so for a purpose. Lamech was a descendant of Cain, the first murderer. Lamech had the ignoble distinction of being both the second recorded murderer and the first recorded polygamist. One might echo the words of Charles Dickens, “It was the best of times, it was the worst of times” to describe this pivotal generation. The obvious comparison of these two individuals made by scripture is both glaring and profound. Lamech is prideful and arrogant in his attempt to excuse and rationalize his sinful impulses. On the other hand, the righteous Enoch is obviously humbled in the presence of his Creator as they walked and communed together. The Bible declares that, “God took him.” There are some who try to say that this doesn’t mean that God took him to heaven. Rather, they maintain that it means that God took his life. Hebrews 11:5 destroys this point of view. The Greek word for pleased literally means “to gratify entirely.” He lived his life with one purpose in mind: to do that which was right before his Creator. As a result, his life was literally transformed to the point in which God transferred Enoch’s address from earth to heaven. In my mind, I envision that one day God probably spoke to Enoch as they were walking together and said, “Why don’t you come to my house and live with me?” And, so it was on that day, Enoch never returned to his earthly home. Noah lived in the tenth generation from Adam. The average life spans from Adam to Noah were 900 plus years. It is mind-boggling to consider the fact that from the time of Enoch to the time of Noah was just 3 generations away. A lot happened in those critical few generations. Mankind had become so corrupt and violent that God had determined that he must destroy that very thing which he had created. This must be done in order to accomplish the promise of a redeemer as found in Genesis 3:15. As we consider just these two antediluvian patriarchs, there is one truth that can be found that is common to both. In fact, it is a truth that we will constantly see throughout the pages of holy writ. That truth is this: “walking with God changes lives.” If you think that you can maintain a close relationship with God without your life being transformed, then you are sorely mistaken. Jesus once said, “My sheep hear my voice, and I know them, and they follow me.” If you are truly one of God’s sheep, are you following him? Is your life being changed? These are questions that you must ask yourself and reflect upon. This modern world in which we now live offers no greater challenges than what were encountered by those two antediluvian patriarchs who put their trust in God. I believe too often we put our Christian bar too low, so to speak. God expects us to strive for so much more. We allow ourselves to be too accommodating to sin. The apostle John wrote: “My little children, these things write I unto you, that ye sin not.” Obviously, this does not mean that Christians are expected to live a sinless life. It does, however, mean that this sinless life should be our goal. In Galatians 5, Paul gives us some advice as to help us in our Christian journey. He uses such phrases as: “walk in the Spirit” and “led of the Spirit” and “live in the Spirit.” The word that is translated “walk” gives us some insight as to the degree in which a Christian’s devotion to God should be. The word literally means: “to walk or tread around.” The allusion is that of a person walking and treading upon the grapes in a wine press. In other words, a Christian’s walk with God should not be one of “tiptoeing through the tulips.” On the contrary, we should be immersed and totally saturated in our walk with God. The three epistles of the apostle John all focus upon this idea and concept of walking with God. In the first epistle, John teaches that, in walking with God, we have fellowship with Him and with each other. It has a dual benefit. John, too, raised the bar when he stated, “walk, even as he walked.” In the second letter of John, he instructs us to walk in truth and in his commandment. Which commandment? The answer: “that we love one another.” That is exactly what Jesus taught: love God, love man. Before commenting on John’s last letter, I need for the reader to read carefully what John writes in that second verse. Some Christians today interpret this verse to mean that John is teaching that it is God’s will that one be materially prosperous, even to the point of being wealthy. Notice John says that “above all things,” he wants this for Gaius. The Greek word translated “prosper” is a compound word meaning well, good and road or way. You could paraphrase it to mean to have a “good journey.” Notice that in the next two verses, John again is talking about walking in the truth. That is the kind of journey that he wishes for Gaius, not that he become rich. In all three of John’s letters, his pressing thought was for the believers to walk with God in light and truth and love. Let that be their journey in life. Paul, in Ephesians 5:2, commands Christians to walk in love. How can someone say that he “loves God” and, yet, not love fellow believers? One of my favorite passages of scripture is Ephesians 4:32. These are the questions that every Christian should ask of themselves: (1) “Am I truly walking with God?” (2) “Is my life being changed in a Godly way?” (3) Do I love others, just as Jesus loves me?” We would all probably have to admit that we have fallen short. I am so thankful that God is merciful, forgiving and long-suffering. Fortunately, God has provided an answer and remedy for our sins. The Bible declares that God called Abraham “my friend.” The word used here means “to have affection.” One day, God looked down and noticed one of the citizens of Ur. Ur was an ancient town situated near the merging of the Tigris and Euphrates rivers. Most likely, it was settled by some of those who were dispersed after the confusion of languages at the tower of Babel. Eber, one of Abraham’s forefathers, probably migrated here. From the name of Eber, we get the name for the Hebrews. God looked within the heart of Abraham (he was called Abram originally) and he liked what he saw. He saw a person who would trust in him and follow God’s purpose and plan. 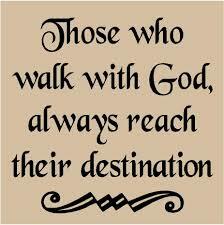 He saw a person who would walk with him and who would allow God to lead and direct his path and life. Although Abraham grew up in a home and family who had forsaken God, he would respond to God’s voice and obey God’s direction for his life. Abraham’s life was transformed as a result of him walking with God. He became the “father of a multitude.” When we look at Hebrews 11, the so-called faith chapter, we find that each of the “heroes of faith” took action in response to God’s presence and influence in their lives. In each case, they demonstrated their faith in God, not by walking after their own desires, but because they walked with God and allowed God to work through them to accomplish his will. Many of these were willing to make the ultimate sacrifice in giving up their lives because of their faith in God. How many of us would be willing to do the same?